If you happen to own a dog whose bark is worse than its bite, perhaps installing the Ultrasonic Barking Dog Deterrent in your garden would be a good idea. Disguised as a birdhouse, this patented outdoor behavior modification device quickly and humanely restores peace and quiet for those vexed by a dogs nuisance barking. When a dog barks within range of the birdhouse, it emits a harmless ultrasonic tone, inaudible to humans, that startles the animal into silence. The dog quickly associates its bark with the unpleasant sound, which conditions him to curb this undesirable behavior. An on/off switch with three sensitivity levels (15 ft., 30 ft., 50 ft.) lets you control the units effective range, and a test mode enables you to verify the device is functioning properly. Its weather proof ABS cabinet can be hung from a tree limb, mounted to a fence post, or hung on a wall. A single 9-volt battery is able to power this for approximately 2 months, while LEDs on it will let you know just how much juice is left inside. The Ultrasonic Barking Dog Deterrent can be yours for $69.95. Looking for an innovative dog bite deterrent for our company’s meter reading staff. 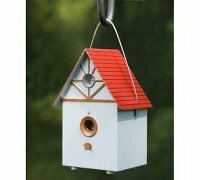 Looking for something other than spray, something along the lines of your birdhouse barking deterrant, that could help prevent bites but could easily carried,attached to clothes or carried in a pocket.